Your Buyer can browse Seasons within your Showroom/eCommerce Store by clicking on "Brands" from the top menu, selecting your Brand and scroll or filter on Collections (Seasons) as illustrated in Figure 1. Your Buyer can click on the "heart" of any product if they want to add it to their "favorites" for quicker access in the future. They can view their favorites for all products by clicking on the heart at the top right of the screen next to the shopping cart. 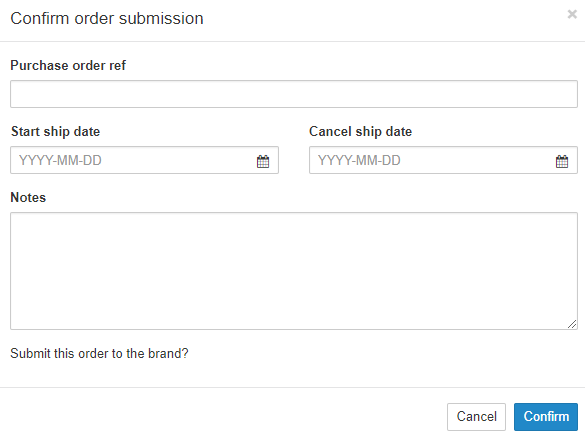 Type the Quantity they want to purchase in the Order Quantity field. 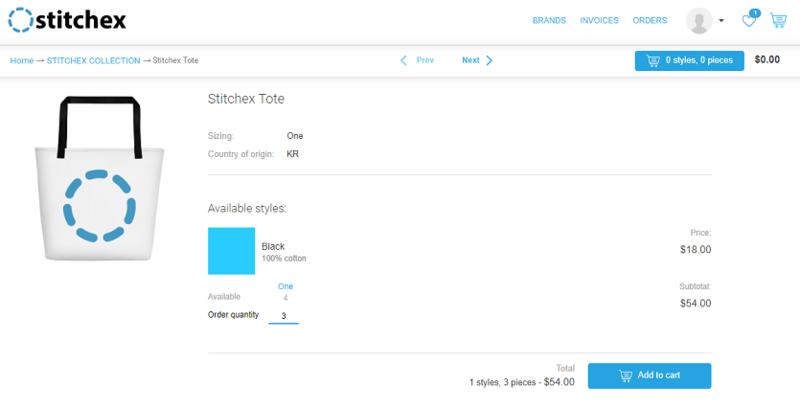 If they hit the "tab" button, Stitchex will give them the total cost for that line item. If your Showroom is configured to only allow customers to order the quantity in stock or available to sell, they will not be able to enter a quantity greater than what is shown as "Available" on their screen. It will not give them an error message, it will simply change the quantity that they entered into the quantity that is available to sell. For more information on configuring your Showroom settings on handling of quantity or available to sell products, see our Showroom, Getting Started Knowledge Article. The Buyer can use these navigation options at the top of their screen to move forward or backwards within the seasons. If they click "Home", they will return to the main product navigation screen where they can select a different Season. 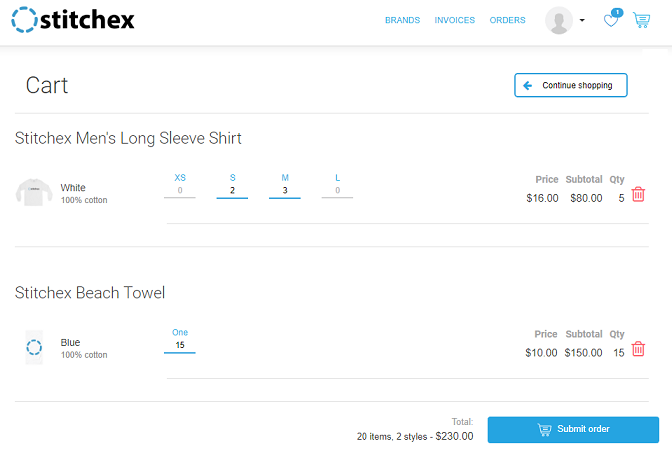 Or, they can click "Next" to browse to the next product within that Season. Along the way, they specify their quantities and "Add to Cart" at the bottom of each page. 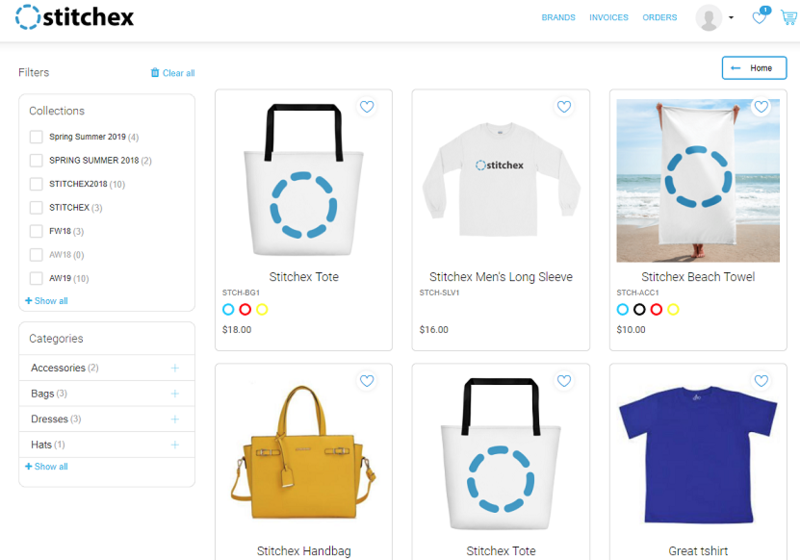 They can also view their cart at anytime by clicking on the shopping cart at the top right of their screen. And, they can select the "Continue Shopping" button if they want to return to the main product navigation screen where they can select additional seasons and products. Once they are ready to submit their order, from the Shopping cart, they click "Submit order" button at the bottom. After the Buyer submits their order, they will be prompted to Confirm their submission. They can enter a purchase order reference number, start ship date or cancel ship date as well as notes. Then, they will select "Confirm". They will receive a confirmation that their order quantities were submitted for review. And, they will be provided with a Sales Order Number. You will see the order arrive as a DRAFT on your Sales Order with a "globe" in the status column indicating it was submitted from your Showroom. See instructions on Managing the State of Sales Orders on how to process. Once you create a Shipment (even if a partial shipment), the status will change for them. However, they will not be able to see what actually shipped.